Today we’ve got a full day to explore the wilderness of Yosemite National Park. And there’s lots of it! Like Grand Canyon NP and Zion NP, Yosemite NP has its own free shuttle bus system. It runs on hybrid drive buses with diesel-electric power, which are on a 10 minute schedule. Great for hopping on or off! We started our day off with a long drive to Mariposa Grove, where the giant Sequoia can be found. In total there are about 500 trees in both upper and lower Mariposa Grove of which trees with names like Faithful Couple, Grizzly Giant and California Tunnel Tree are the vest known trees. And yes, we walked through a tunneled tree! Previously, there were two, but the biggest of the two toppeled over in 1957. There is very much wildlife to be seen in this park. There are a lot of deer, chipmunks, squirrels and even bears. We are proud to say we’ve seen all of those. Yes, we even stumbeled upon a bear! It was a small black bear, which is remarkably brown for it’s name. We suspect it was a juvenile bear, as it was not as big as a fully grown bear and there was not a big bear in its vicinity. We hope. We actually don’t know. It was a bear. And it was not as big as you’d think. Still a bear though! Amazing! Yosemite is perhaps most famous for having huge waterfalls by the dozen. And huge they are! 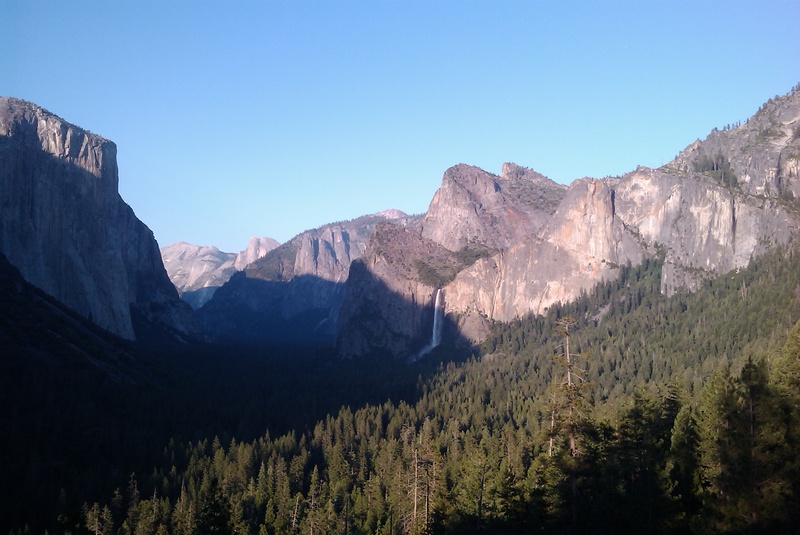 They are not by the dozen, but we visited the three most famous ones: Yosemite, Bridalvail and Nevada falls. Especially Bridalvail falls is amazing as it gives out a huge spray which photographs really well, but you and your camera will get soaked by doing so. Really big fun. The park also boasts about having the best scenic view in the world. 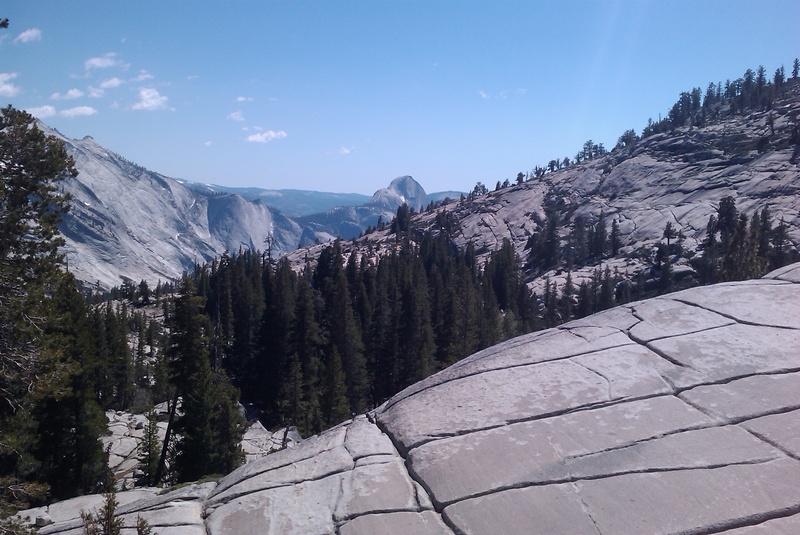 It is said to be from Glacier Point and is located around 7200 feet or 2200 metres above the valley floor. It also gives you a spectacular view of the granite mountains on the opposite side if the valley, which are whopping big and equally tall. I must say, we were impressed by the shear size of it all and the grandeur such a view just has. Perfect place to end a wonderful day! Unfortunately, as Yosemite National Park too is really big, we had a 45 minutes drive to the pizza place for our dinner. As described, there was not a lot to choose from, so pizza it was! Good pizza, even though we were both too tired to enjoy it fully. We tucked in early, as the next day would be the day that we are driving to San Francisco! We are really looking forward to it, as we’ve only heard great stories about the city.